When I was growing up in the Chicago area, winters meant snow, mittens, freezing cold, and hibernation. When I moved to the Denver(ish) area of Colorado, I found out that winter doesn't necessarily mean "white." It snows here, but most often in the spring than in the dead of winter. And of course it gets cold, but not as bitter as Chicago winters. And when it's sunny - which it often is - it can be pretty pleasant outside. Not shorts and flip-flops pleasant, but pleasant enough to do some grilling without turning into an icicle. Yup, if you've got a yen for grilling, the smart thing to do is pick a sunny day, and, well, grill in the sunshine. If you wait until after dark, it feels a lot chillier. When I got an offer through Clever Girls to work with Kraft on an outdoor, out-of-season grilling recipe, I figured it would be a no-brainer. I love barbecue sauce, and the grill was waiting. They sent along some of their revamped barbecue sauce (which they said features high-quality ingredients like tomatoes, sweet molasses, cider vinegar and cane sugar. And NO high fructose corn syrup). I received the Original, Hickory Smoke, and Sweet Honey; the other flavors are Mesquite Smoke (oooh, I need to try that! ), Sweet Brown Sugar, Sweet & Spicy, Spicy Honey, and Thick & Spicy. Besides the sauce, they sent some grilling gear, including an ingenious mitt called the Evergriller Grill 'N' Flip Mitt that has a pocket-like mouth on the front end, so you can insert the handle of your chosen barbecue tool and grab onto it while keeping your hand safe from both the heat of the grill and the chill of winter air. And from the chill of the barbecue tool, if you left it outside in a snowbank, I guess. Armed with sauce and swag, I tried to decide what to make. For inspiration, I opened the Hickory Smoke sauce first, because I was curious if I'd like it or not. A lot of hickory-flavored sauces taste fake to me, but this one was pretty darned good. As in, I'll probably buy a whole lot more of it. I slathered the sauce on chicken wings and baked it onto chicken thighs - got to do some quality control tests, right? I was thinking about buying some ribs for the official test and post, but I thought ribs might be way too simple. I wanted to do something different. Creative. Then the idea hit me. Pizza. But not just any pizza. Pizza with HAM. 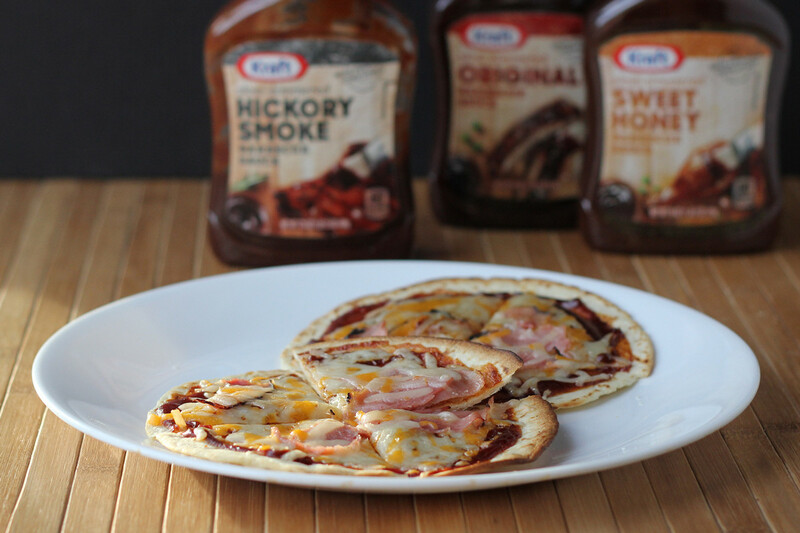 The idea of combining ham with barbecue sauce came from a sandwich served one of my favorite places in Chicago that served a barbecue ham sandwich. I know it's not traditional, but it's really good. And I figured that pizza would be a perfect vehicle for my barbecue sauce and ham, because it gave me an excuse to add some melty cheese. For my crust, I used a flour tortilla, to make a super-thin-super-crunchy crust. I used the smallest ones - labeled "fajita" size - about 5 1/2 inches in diameter. 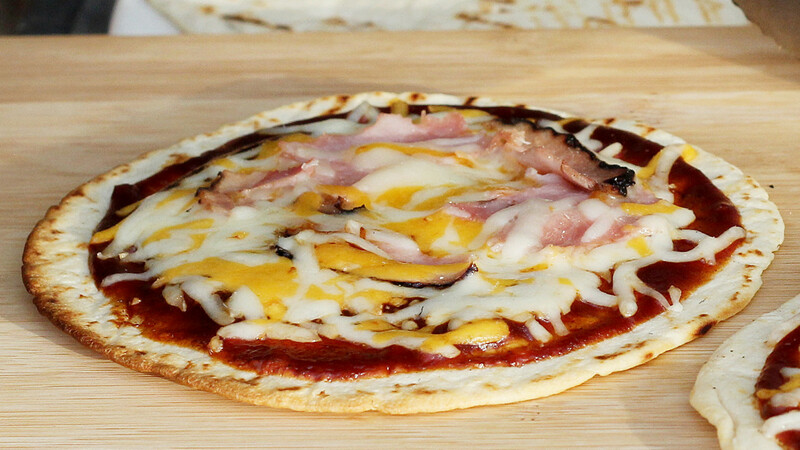 While you could use a larger tortilla for larger pizzas - the burrito size are pretty big - the smaller ones are easier to handle, and you can customize the toppings, if you like. And since these are small, two of them make a nice serving size. 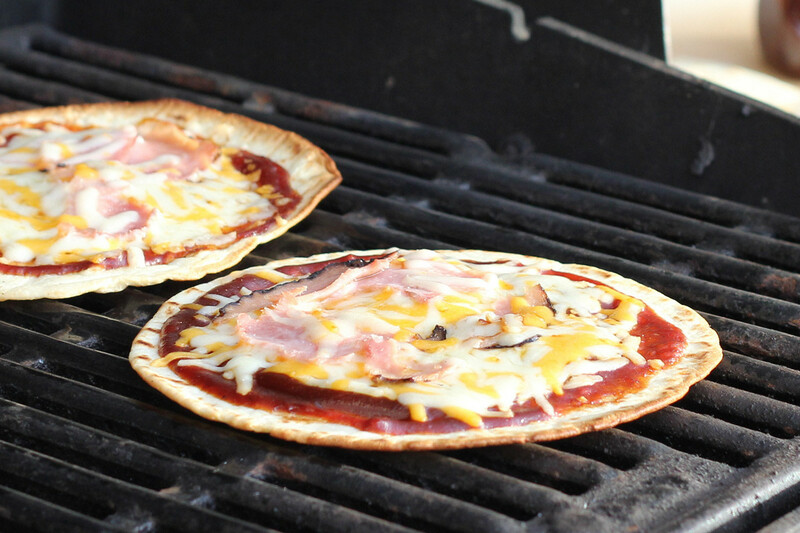 The key to these little pizzas is to prep the tortillas ahead of time, cooking and flipping them on the grill until they've become somewhat crisp. That can be done ahead of time, and then the pizzas can be topped and finished as needed. Figure out how many pizzas you're going to need and multiply the ingredients accordingly. You can adjust quantities to taste, but I thought this ratio worked well. Extra tortillas won't go to waste, if you grill them until they're crisp. You can break them up to make crackers, or save them for another day of pizza-making. Make sure you've got the grill set up with direct heat to pre-cook the tortillas, and indirect heat for finishing the pizzas. Over direct heat on your grill, cook the tortillas, flipping them regularly so they cook and get grill marks, but they don't burn. The tortillas are done when you can pick one up and it's rigid rather than floppy. They don't need to be completely solid - just rigid enough to hold their shape. 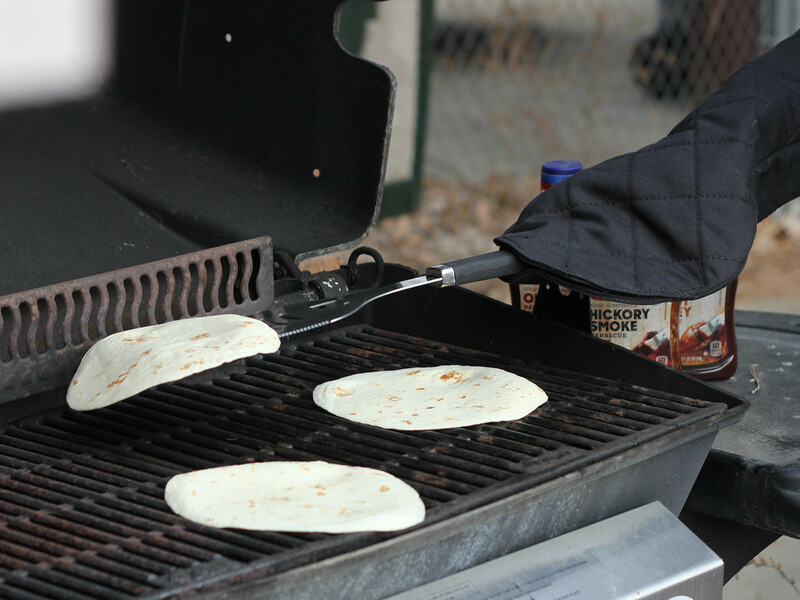 Remove the tortillas from the grill (if it's freakishly cold out, bring the finished tortillas indoors to prep them.Spread the barbecue sauce on top of each one, almost to the edge. Top with ham and cheese. 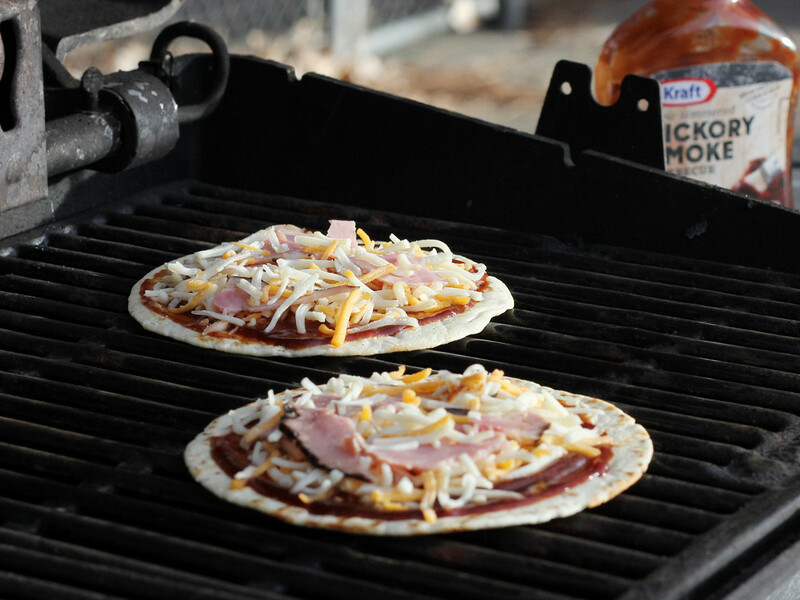 Place the pizzas back on the grill over indirect heat and close the lid. Let them cook until the cheese has melted and the ham has warmed - this takes just a minute or two, depending on your grill. 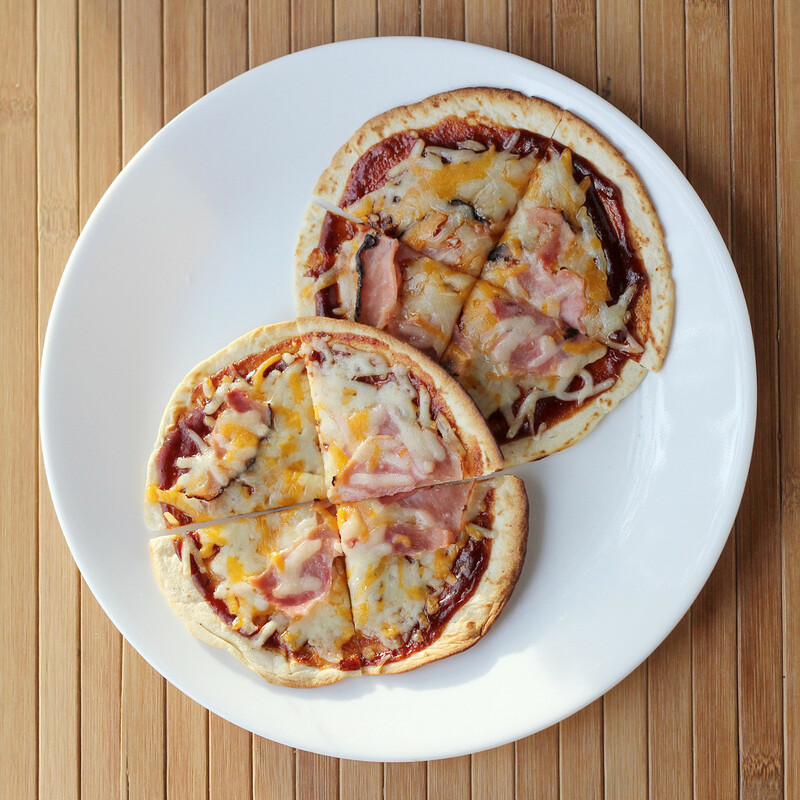 These are nice served with a green salad, but if you want to offer additional toppings on the pizzas themselves, then diced tomatoes, shredded lettuce, and pickled jalapeno peppers would work well. If you're interested in winning your very own Evergriller Grill ‘N’ Flip Mitt, along with a year’s supply of Kraft Barbecue Sauce, go to GrillinFools.com between now and January 30. The winner will be randomly selected at the close of the giveaway.